I was interested in cooking since my childhood as my parents owned a restaurant in Nepal. I was inspired by them. While growing up I helped my family in and out in their restaurant business. I chose the profession that I was interested in, cooking and creating new flavors through mixtures of various food. Sanjeev Kapoor, who received the ‘Best Chef of India’ award by the Government of India, and is a television personality. I used to watch his TV show regularly and learned his techniques. Mixed grill Kabob is my main dish on the Chef’s menu – it has an assortment of different varieties of meat with Himalayan spices. 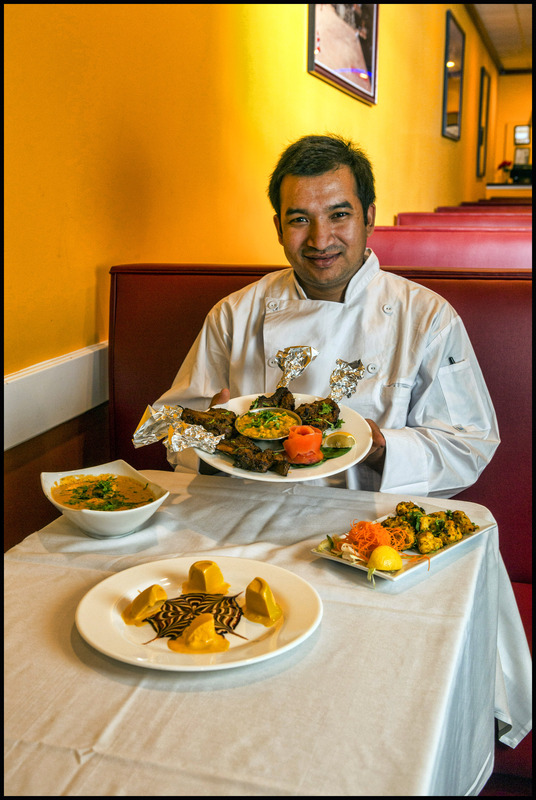 Our menu contains not just Nepali dishes but a variety of Indian and Indo-Chinese dishes to please our customers. What do you do to ensure the quality of the food going out to customers? I check the quality and quantity of food that includes proper cooking and the right amount of spices with safety measures as directed by the Department of Health. Master Chef Sanjeev Kapoor! Sanjeev is an Indian Master Chef, author of best-selling cookbooks, and architect of a unique range of food products. He stars in the TV show Khana Khazana, which is the longest running show of its kind in Asia; it broadcasts in 120 countries and in 2010 had more than 500 million viewers. He launched his “Food channel” in January 2011. Chicken Momo; as it is very popular and I want to have large quantities. Momo is a minced chicken marinated in Nepali spices stuffed in flour wrap and steamed. Served with a special spicy sauce. Momo has become a traditional delicacy in Nepal, Tibet and India.